I like this book. It is the first published effort to provide a well-rounded and comprehensive review of information concerning Chen Style Taijiquan. For the past thirty years many writers and practitioners have provided their views on what taijiquan (tai chi chuan) is. In my opinion they have been almost universally far from the mark. In this volume the authors have, with their first effort, raised the standard of information considerably. 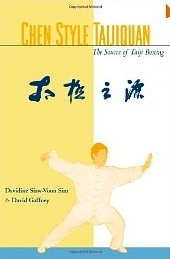 Within its 224 pages the authors make no attempt to provide instruction on taijiquan. There are no picture of postures or descriptions of movements. Rather they have successfully managed to provide a clear technical framework for all students of taiji and particularly students of Chen Style taiji. Its layout is clear, providing a substantial historical and cultural perspective. This is followed by a substantial effort to describe the foundational elements of Chen Style. Training methods, forms and weapons are all included. The book concludes with some wonderful stories about some of the Chen family’s historical figures. Some of this volume, particularly the Foundation chapter, does offer the opinions of the two authors. These opinions have been hard earned, through many years of dedicated practice and a willingness to travel to gain access to the finest practitioners and teachers in the world. (These include Chen Xiao Wang, Chen Zheng Lei, Zhu Tian Cai and Guo Kong Jie.) So while in some small way I disagree with some of their analysis, overall I strongly recommend this book. Without good understanding it is not possible to learn this art. This book provides a most valuable first step in gaining that understanding. I look forward with anticipation to their next book.